21 February is the International Mother Language Day in the world. 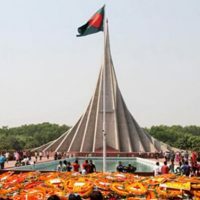 The event began being observed from 21 February 2000 throughout the world to commemorate the martyrs who sacrificed their lives on this day in Dhaka in 1952. The background to the proclamation of the International Mother Language Day was a proposal from Bangladesh at the UNESCO General Conference in Paris on 17 November 1999 to declare 21 February as an international day on the ground that on this day many had sacrificed their lives for their mother tongue. It was argued that, since the languages of the world are at the very heart of UNESCO’s objectives and since they are the most powerful instruments for preserving and developing the tangible and intangible heritage of nations and nationalities, the recognition of this day would serve not only to encourage linguistic diversity and multilingual education but also to develop a fuller awareness of linguistic and cultural traditions throughout the world and to inspire international solidarity based on understanding, tolerance and dialogue. The Paris Conference was convinced that one of the most effective ways to promote and develop mother tongues was the establishment of an International Mother Language Day throughout the world with a view to organising various activities in the member states and a language exhibition at UNESCO Headquarters on the same day. The day the Conference chose for the purpose was 21 February. This was, indeed, in appreciation and recognition of the unprecedented sacrifice made by the Bangla speaking people of Bangladesh for the cause of their mother tongue (matribhasa) on 21 February 1952. The Paris meet also put on record how solemnly the people of Bangladesh have been observing the day as Martyrs’ Day (Shaheed Dibash) ever since 1952, and how the People’s Republic of Bangladesh has been observing the day as a special national day since its emergence as an independent state in 1971.